Twain lived and wrote in Hartford, Connecticut for the majority of his career. It was in Hartford that he scribbled such works as The Adventures of Tom Sawyer and Life on the Mississippi. As much as Twain loved his quiet house where he could sit and smoke, he longed to travel the world; to “throw off the bowlines [and] sail away from the safe harbor” as he once said. In 1878, Twain took his family and set sail for Europe, where they spent the summer in the German city of Heidelberg. When Twain arrived in Germany, his writer’s block had left him with an unfinished manuscript that would later be known as Huckleberry Finn. He already had written of a long, wide river, but his time spent on the Neckar River is believed to have given him the inspiration necessary to finish the novel when the family returned to the U.S. If you’re lucky enough to visit Heidelberg, you may want to take advantage of the many Mark Twain inspired tours that are offered throughout the city. A tour guide, who may or may not be dressed as Twain, takes you through many of Twain’s haunts. 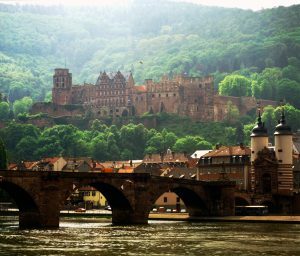 Not only will you be able to see the Neckar river in all of its beauty that Twain described, but you’ll have the chance to explore Heidelberg’s thriving college scene as well. AESU offers several trips to Germany, including Cosmopolitan, Euro Spree, Explorer, Euro Focus, and our most popular tour, Great Escape. Explore Germany and its rich history and culture. This entry was posted on Wednesday, February 22nd, 2017	at 11:00 am	. You can follow any responses to this entry through the RSS 2.0	feed. Both comments and pings are currently closed.